Sustainablity has been the buzz word in the fashion world over the last few years. “The idea is to use this initiative to help revitalise khadi,” says CMD Gautam Singhania. Fashion designers are working with artisans to help keep their crafts alive. Now the corporate is taking the opportunity to help artisans. Mumbai-based Raymond Ltd. is one such company. Over the last year, Raymond has embarked on an ambitious mission to position khadi from being the fabric of our nation, to the fabric of choice. On this journey, the company is taking the artisan from developing the fabric to giving it a more contemporary look for today’s generation. When the Khadi & Village Industry Commission (KVIC) approached a few Indian textile companies to work with them and help the khadi clusters, Raymond was quick to jump on the opportunity. Being committed towards the ‘Make in India’ initiative and aligning with Prime Minister Narendra Modi’s vision of “Khadi for nation to Khadi for fashion,” Raymond’s partnership with KVIC is to help revitalize and promote khadi. The idea is to use this initiative to explore the synergies between Raymond and khadi, and make the simple fabric more appealing to the younger generation. “Elevating Indian craftsmanship to a whole new level, Raymond’s khadi initiative celebrates a fabric, unique to the Indian ethos and blends it with contemporary sensibilities appealing to today’s discerning consumer,” says Gautam Hari Singhania, CMD, Raymond Group. “It also creates a socially inclusive business model providing economic upliftment to millions of artisans across the country,” he adds. So what is khadi? Khadi is anything that is hand spun. The spinning is done on a charkha, and the weaving is done on the handloom machines by the clusters. From the consumer point of view, khadi is perceived as khaddar –a rugged fabric. Earlier you could only get plain khadi fabric in cotton or silk. It has evolved a lot over the years. Now it is far smoother and lighter than what it started out as. Hence, khadi clothes are more comfortable and can hold more dyes. It is a versatile and comfortable fabric, one that the common man has been wearing for a long time. An all weather fabric, khadi keeps one cool in the summer and warm in the winters. As the core purpose of the initiative is to increase captive demand of khadi, thereby generating additional man-hours, Raymond was open to engage with any khadi institution. However, different types of products played a significant role in shortlisting the region where the company wanted to focus. For example, the company is working in Jammu & Kashmir for pashmina, Rajasthan for merino wool khadi, West Bengal and Bihar for fine muslin cotton, Assam for eri and munga silk, Karnataka for mulberry silk, other South Indian states for cotton yarn dye shirting, Gujarat for cotton, etc. According to Sanjay Behl, CEO, Raymond Ltd., “We would prefer to focus on institutions which are not doing well, and can be revamped with Raymond intervention,” he says. Initially, the company started working with 20 clusters. Today, the company is working with more than 75 clusters in 16 Indian states. 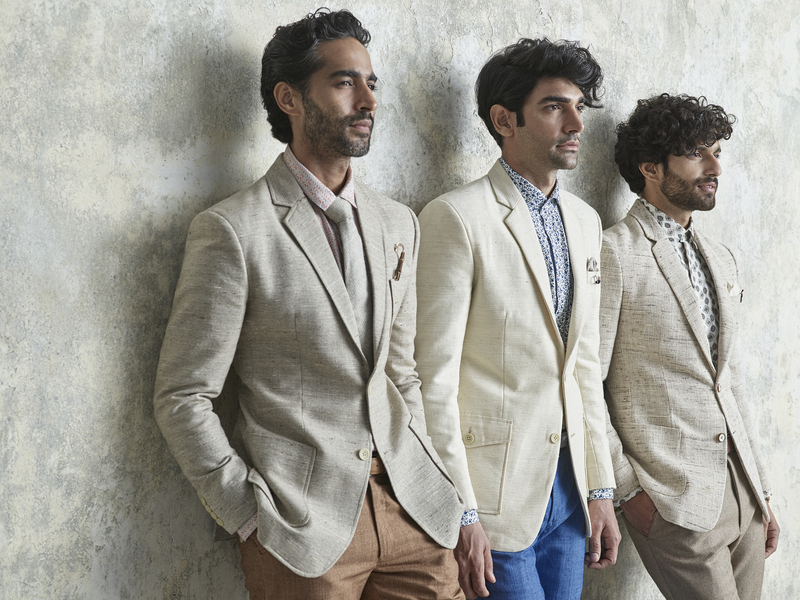 Since its launch in 2017, Khadi by Raymond has done three collections of menswear. The product range comprises an array of Indian and western casual attire – shirts, trousers, jackets, kurtas, bandis, bandh galas. Price range varies from Rs2,800 – Rs3,500 for shirts, stylised trousers at Rs3,500. Jackets and bandh galas at Rs7,000 – Rs9,000. Bandi and kurtas anywhere from Rs3,500 – Rs5,000. All the Raymond khadi products have the KVIC stamp. Shoes and accessories such as tie pins and lapel pins have been added to complete the collection. So what is the business sense of getting into khadi? While the whole khadi initiative draws its inspiration from the Gandhian philosophy of improving self-sufficiency of rural India through preservation of traditional craft and cottage industry, “there is also a meaningful business opportunity if the value-chain of the industry is streamlined and aligned with the needs of the new consumer of today,” says Mahajan. Given its technical expertise, strength in design and marketing and its massive distribution network, Raymond is uniquely positioned to make this happen and thus contribute to making khadi the global powerhouse that it deserves to be. Challenges on the supply side had to be fixed for catering to a larger market. The entire production chain was unorganized with limited capacity at one center. The artisans involved in the khadi industry, either work from home or in village vicinity. Spinning, warping and weaving are all executed at different locations, which limits building an effective linkage throughout the value chain. Poor infrastructure and dependence on workforce availability impact the production capacity of clusters. Low wages also contribute to the challenges in engaging artisans in khadi production. So Raymond deployed a dedicated team of designers and quality experts to upgrade the skill sets of artisans through design and quality intervention. Initially Raymond’s sourcing team found fabrics in various shapes and sizes. Even the width wasn’t common across the wide array of fabric. So the Raymond team had to guide and educate the clusters about the kind of fabric that was required by the company, standardising the width and what kind of yarns the company used. Once the company got the fabric, it had to be treated – softened, washed, finished, and digital printed – using the company’s expertise. It is after this that the company gets a product that is acceptable by the customers. It took the company a year and a half to standardise the fabric they acquired from various clusters. “We had to teach them techniques, we had to tell them where they were going wrong, and therefore make sure the output is standardised,” says Mahajan. On the design front, Raymond is engaging with multiple independent designers to create fashionable khadi clothing solutions as per market trends. Through its association with IMG Reliance, Raymond has connected with a cluster in Assam for muga silk, which is a UN project. While the work that Raymond is doing with the clusters is good, the company has to deal with building the category as well as changing the perception of khadi. In a consumer survey that was conducted on behalf of the KVIC, only 22 per cent of the khadi non-users perceive khadi makes a fashion statement, while most people (57 per cent) perceive khadi to be used only by politicians. For now, the company is in the initial phase of the category development and will chart out its expansion plan as they move ahead. Going forward, the company will continue to work with these clusters. “We strongly believe in the potential of the category and will continue to invest in building the sustainable value chain which can meet the demand of the market,” says Singhania.